Light winds 11-14 knots from the southeast blew during our trip from Saba to St. Kitt's. It would have been a lovely sail had we been going any other direction but that is where we were headed, directly into the wind. As the distance was 56 miles we opted to motorsail the most direct route to insure arrival by dusk. A charter boat captain we met in Saba said there was good fishing along the bank between Saba and St. Kitt's. We dragged a line with no luck. 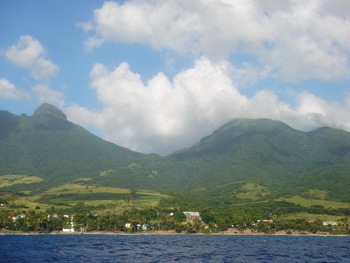 St. Kitt's (short for St. Christopher's) and Nevis are two more volcanic islands that rise steeply from the sea with their peaks often hidden in the clouds. Forming the smallest nation in the Western Hemisphere, the islands were inhabited by several native cultures before Columbus claimed them for Spain. 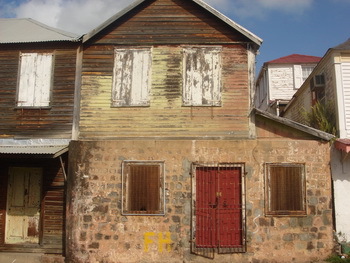 St. Kitt's and Nevis were ignored for a couple of hundred years until the British settled and established sugar cane fields and began making rum. Often fighting with France on St. Kitt's for a century, the land became officially British in 1783 with the signing of The Treaty of Paris. 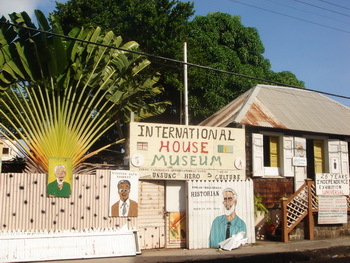 In 1983 the two islands were joined as an independent federated state. 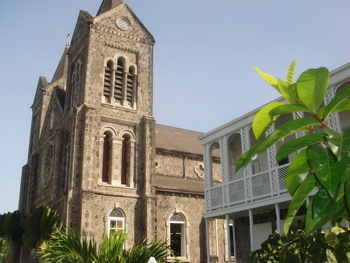 We arrived in Basseterre at four in the afternoon. Wanting to top up our fuel tanks we checked into the marina only to find out their fuel pumps were out of order. It seems someone had high hopes for this marina at one time but now only a handful of yachts joined the fishing boats tied in the dutch style slips, and the surrounding buildings stand mostly vacant. Still, it wasn't a bad experience. The dockhand was especially friendly in an easy-going way. He told us about the city and what was going on the next few days. As I tidied Tenaya Jim went to customs and immigration, an easy affair here. 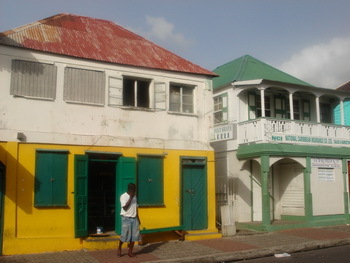 Basseterre is the capital and we were excited to have a look around. We were pleased to see the cruise ship pulling away. Street vendors selling mostly food lined the busy street along the waterfront. The aroma of grilling chicken smothered in spices enticed us and we ordered some to take back for dinner. Very tasty indeed! 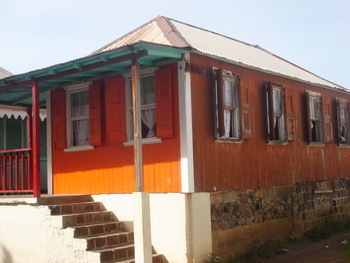 Basseterre has plenty of personality. Small, colorful houses along with shabby, rundown houses are squeezed into the narrow streets. 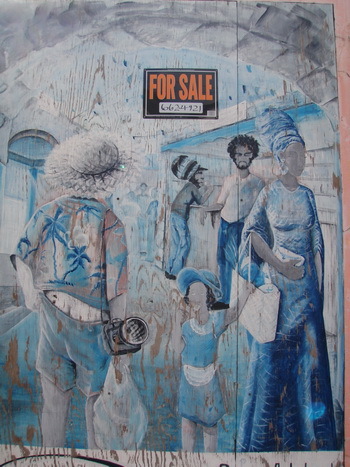 Enthusiasm for upcoming elections is obvious by the multitude of banners and signs endorsing candidates and passionate and humorous murals decorate many walls. In the evening wonderful Calypso music, sometimes from multiple sources, kicked off Carnival. 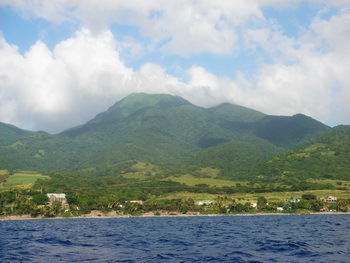 On December 20 we motored 13 miles to Nevis. Again the wind was right on the nose. As we motored into Pinney Beach and headed for a mooring ball in front of the restaurant reported to have wifi we noticed the people on the catamaran in front of us waving. 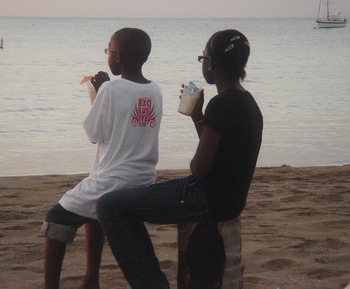 It was TL and Harriet aboard Hands Across the Sea, wonderful people we met last season in Dominica. They swam over for a visit and we will see them again in Roseau, Dominica. That evening we met Hud, a moderator for the informative Cruisers and Sailing Forum, at the Double Deuce bar and restaurant. Over a couple of beers we talked sailing and boats. Jim and I stayed for a delicious dinner, well worth the flying pests and itchy bites. 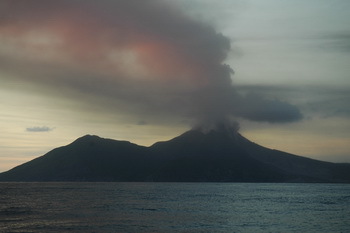 We are fascinated by volcanoes and having sailed by Stromboli without stopping we definitely wanted to visit the island of Montserrat. 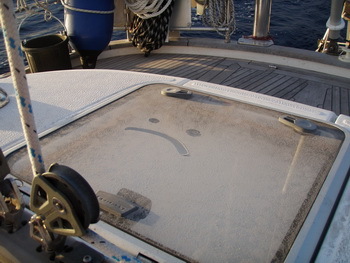 We had a two day window when the anchorage would be comfortable and safe before the north swell returned. Perfect! Off we went the following morning to Montserrat, 35 miles to the south. There was barely a breath of wind as we motored over the calm sea. The sky above the island loomed dark, smoky and foreboding similar to when a forest fire is raging. As we neared ash fell hard trying desperately to get into our eyes and thoroughly coating Tenaya. 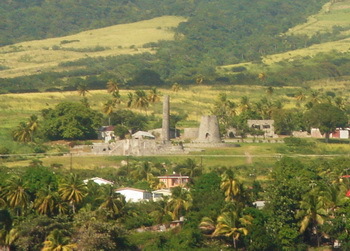 The volcano erupted here in 1995 burying much of the southern part of the island along with the capital city of Plymouth in several feet of ash. The danger rises and subsides and just a few days ago the alert was raised to Level 4 as the mountain's	belching	increased. That meant we could not view any of the affected area. As our desire to spend any time on Montserrat decreased in direct correlation with the air quality, we opted to eschew geological enlightenment for some French wine, cheese and fresh air. 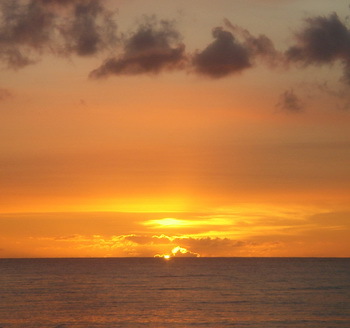 We changed course and sailed through the night to Basse Terre, Guadeloupe. Several small fishing boats dotted the sea as we moved across the bank near Redonda, a small island between Nevis and Montserrat. We decided to try our luck at fishing again and put out the line. We checked it constantly for the first hour and then forgot about it. I looked back and saw the line taut with a fish flappering about at the end. "We've got a fish!" I exclaimed to Jim as we both hopped up. We were thrilled! "What do we do now?'' we both asked. I got our guidebook and fishing book out while Jim pulled it in. What would it be? A very unhappy, rather large barracuda with a mouth full of extremely sharp teeth sneered at us as Jim pulled him out of the water. I furiously flipped pages to see if it was safe to keep as I recalled barracuda carrying the toxin that causes ciguatera. Ciguatera makes people very sick and 12 percent of those infected die. 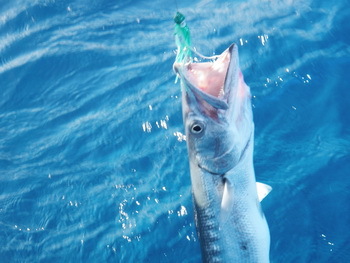 Yup, sure enough, the books say it might be safe to eat small barracuda less than 4 pounds but do not take a chance with any caught in the area of Redonda. 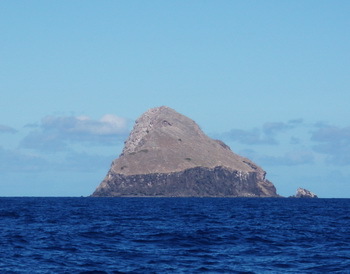 At the moment I could have swam to Redonda. It didn't look like we could safely pull out the hook out and free the fish, and it didn't seem right to cut it loose with both the hook and lure in its mouth. Not knowing what to do we let the line back out and dragged him behind the boat as we searched the pages for help. Soon we concluded that it would die so instead of torturing it further we poured rum into it. As it died it snapped the line and floated away. We both felt horrible and I doubt we'll want to try fishing again any time soon. I believe that what goes around comes around. The last time I killed what I consider a predatory creature (a wasp) I was stung by one shortly thereafter as I picked up fallen apples from our tree. I don't even want to think about this barracuda's brethren settling the score.